KHAD Eco Team Universitas Muhammadiyah Yogyakarta after launching its electric car on Friday November 3rd, 2017 at 2nd floor of Stadium General Building F1 in the 2nd floors, immediately departed to Surabaya to join the Electric Car Race held at Kenjeran Park. Within 5 days, KHAD Eco Team UMY members are in Surabaya and attend the competition organized by the Ministry of Research, Technology and Higher Education Republic of Indonesia (Kemenristekdikti RI). Ten November Institute of Technology (ITS) is also hosting the 2017 Energy Efficient Car Contest. This competition is an annual competition in the arena of creativity of Indonesian students in Energy-Saving Innovation, initially called IEMC (Indonesia Energy Marathon Challenge) and since 2012 it has been changed to KMHE (Energy Efficient Cars Contest 2017). This national-scale competition attracts the students’ interest in sharpening their creativity, as seen from the many participants who participated in this KMHE competition, of which 77 teams from 43 universities all over Indonesia participated and presented their innovation at Kenjeran Park Circuit of Surabaya. 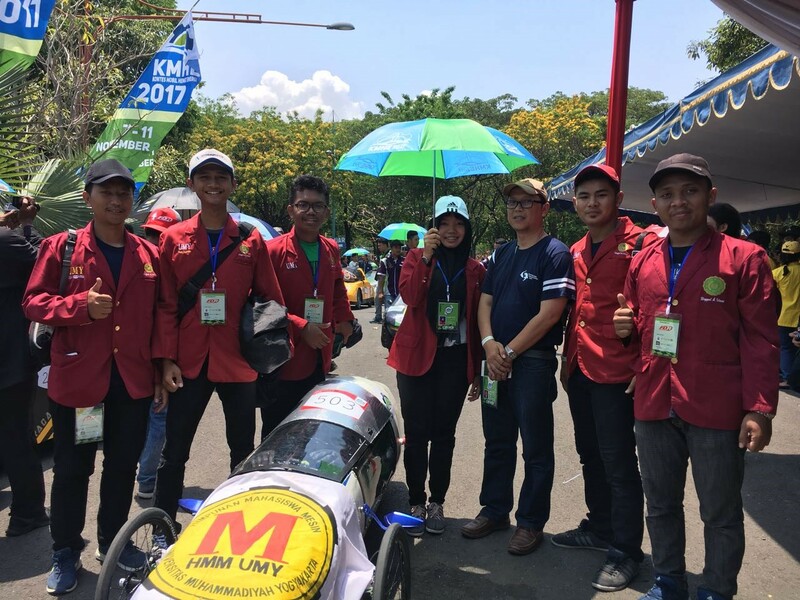 KHAD Eco Team UMY Electric Car also became one of the participants in the race, in the Prototype category, KHAD Eco Mobil UMY Electric Car Team ranked 6 out of 17 participants. KHAD Eco Team UMY members also feel that by joining this competition they can to sharpen mentally, adding knowledge. For the next race, KHAD Eco Team UMY will also continue to give maximum effort in following the race event, the member believes get the champion is a bonus when they have given maximal effort and can it the name of university of course.